The first time I met Peter Pan, I was sitting in my living room with my brothers and sisters. He didn’t come flying through the picture window or anything else as exciting and dramatic as that. Instead, he flew into my imagination via our television set. Even though the version we were watching was old, the scenery was the furthest thing from life-like, and Peter Pan was himself played by a woman (Mary Martin), I was captivated. The idea of defying the inevitable enticed me. For me the idea of living as a child forever was the heart and soul of this story. Everything that happened happened because Peter Pan wasn’t going to grow up and he was trying fiercely to get others not to grow up either. But, of course, none of the viewers were fooled. Growing up can only be prevented by one thing. And it wasn’t until recently that I read about James M. Barrie’s personal connection with that. Because it was only recently that I actually read his book. Thanks to Michael Clay Thompson. He suggests a few activities for Preparing, but most of the emphasis is on the actual reading of the story. That is the main event, as it should be. The last two levels MCT lists are important in that they help a student think about the story and its characters once the reading is finished. The prompts for Creative Thinking are creative in and of themselves. They stir discussion and are intriguing to think about. The last level, the Writing, is especially important for developing a student’s application of grammar and essay writing skills. While reading, there should be pauses to reflect on the characters and to clarify the meanings of unfamiliar words. When I pause to talk about the unfamiliar words, I like to point out how the words J.M. Barrie used are something he chose. He passed over other words that might have kind of fit in favor of the one he used. At the end of the story or after we have read several chapters, I might choose a quote or a paragraph from the story and ask my students to again tell me about the word choice. What does the word J.M. Barrie used bring to the sentence or paragraph that a synonym of that word might not? I love the reminder that we as teachers need to limit our interruptions to the reading. With that being said, in each of the books MCT includes in his trilogies, he does indeed interrupt the reading to point out some things. Sometimes it is the grammar of a particular sentence that he points out. Sometimes it is the rhythm of a particular sentence that is reinforcing the message of the sentence. Sometimes it is the poetic quality of a particular line, purposely creating a subtle feel in the reader’s mind. For example, here is one of the “language illustrations” he has included in this story. 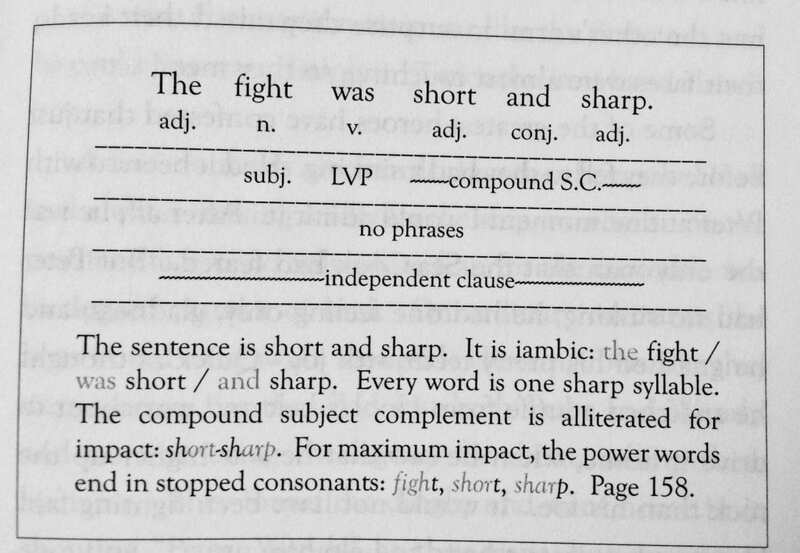 As you can see, MCT not only points out the grammar using his 4 Level Grammar Analysis, he also connects the grammar use to the writing. He points out the meter and the word choice and how all those things enhance the moment in the story for the reader. His interruptions are not a list of questions for the students to answer. They actually enhance the reading experience by pointing out something that the readers (and sometimes the teacher) might not have noticed on their own. This is one way in which MCT is pulling together all facets of the literacy ecosystem that I’ve described above. If you’d like a look at his materials, here is a link: Royal Fireworks Press. James M. Barrie was born in 1860. He was the ninth of ten children. When James was 6 and his next older brother was almost 14, his brother died in an ice skating accident. His brother David had been their mother’s favorite and she was inconsolable. James tried everything he could think of to make her feel better. He even dressed in his brother’s clothes. He spent a lot of time with her and listened as she spoke of her childhood. Her own mother died when she was just 8, and she assumed the household duties at that time. She also told him that she found some solace in knowing that David would be a boy forever. That idea of being a boy forever …. J.M. Barrie knew he wanted to be a writer early on. He began by writing some of the stories his mother told him. As his career began, he met a family with five boys, one of whom was named Peter. He became close to the family, often telling the boys stories. One of those stories included Peter’s ability to fly. When the parents died (1907 and 1910), J.M. Barrie adopted the boys. Here is a link to a brief biography: The Family That Inspired J.M. Barrie’s Peter Pan. I’m going to spend the rest of this post sharing some of the words and phrases my students and I found which have strengthened our connections to the action and to the characters. First off let me say just how refreshing it is to read a book with such beautiful language! My students and I are reading it aloud and thoroughly enjoy discussing the action, the characters, the author’s message, but most of all, we enjoy the words that Barrie uses. I’m not sure whether or not readers in his day would have been as intrigued by the vocabulary, but we sure are. As I list each word, keep in mind that I did not stop the reading to investigate any of these words. We only stopped long enough to clarify the word’s meaning and its use in the context of the story. It is my plan to share the following list with my students at another time in our day and give them the opportunity to choose one to investigate. I’m sharing things with you that I find interesting about these words and giving suggestions for possible activities. One of the first words to catch our attention was perambulator. It was in the middle of a paragraph describing the nurse dog, Nana. At the bottom of the page, MCT had included a definition of this word so that we didn’t have to look elsewhere at the moment and could get back to the reading. 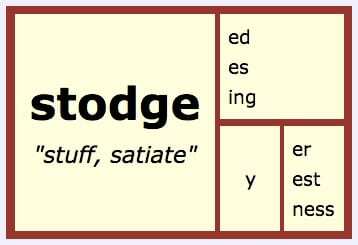 But a look later at Etymonline told me that this word was first used to mean a baby carriage in 1856 (that is what it is referring to in the story). Prior to that, the <-or> suffix indicated an agent noun. So a perambulator was someone who perambulated. 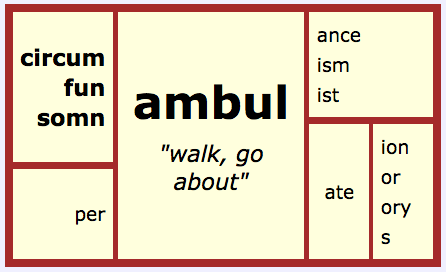 The word <perambulate> is from Latin ambulare from <per-> “through” and <ambul> “walk, go about”. Here is an example of a matrix that could be created using the base element <ambul>. What I absolutely love about this family of words are the compound words that can be made. Looking at <circumambulate>, we see the first base element <circum>, which is from Latin circum “all around, round about” and Latin ambul “walk, go about”. So someone who is circumambulating is walking all around an area. The next compound word on this matrix is <funambulist>. This word is from Latin funis “a rope, line, cord” and Latin ambul “walk, go about”. The suffix <-ist> is an agent suffix here and is indicating that a funambulist is a person who walks on rope – a tightrope walker! The last compound word is <somnambulate>. This word is from Latin somnus “sleep” and Latin ambul “walk, go about”. If you are guessing that to somnambulate would be to sleepwalk, you would be correct! Of course, familiar words like <ambulance> would need to be noticed as well. But what does an ambulance have to do with walking? According to Etymonline, around the 17th century, the French used the phrase, a hôpital ambulant, which literally meant a walking hospital. The hospital was built in such a way that it could be torn down and moved to a new location. We might think of them as field hospitals. By 1798 it was known as simply ambulance. I know that any of my students would enjoy this rich treasure hunt! According to Etymonline, <exquisite> was first attested in the 15th century. At that time it meant “carefully selected”. It is from Latin exquisitus “carefully sought out”. As it is used in the passage below, it has more of a sense of “with perfection of detail, elaborately, beautifully” (as listed in definition 2 in the Oxford English Dictionary). Both sources identify this word as from <ex-> “out” and quaerere “to search, seek”. So something that is exquisite is carefully sought after for its perfection of detail! That would make sense in the context of describing Tinker Bell’s skeleton leaf gown. 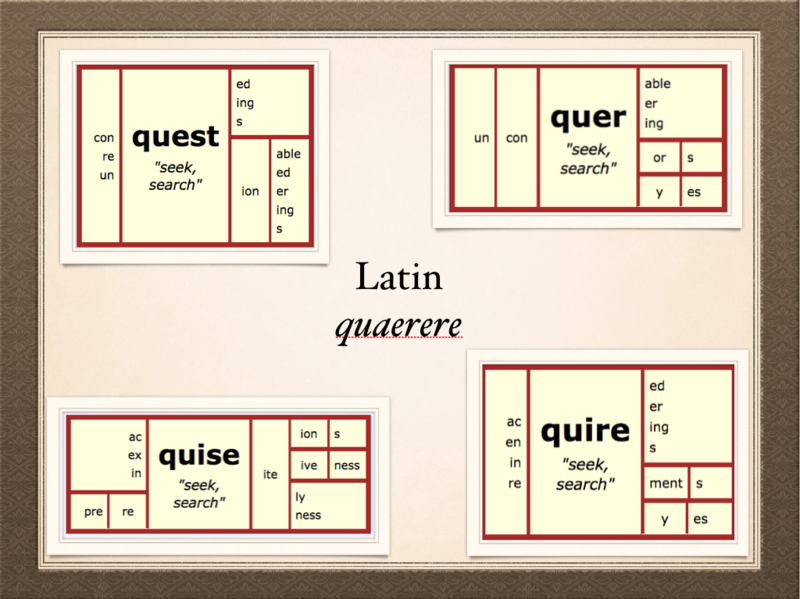 The word <exquisite> is just one of many descendants of Latin quaerere “to search, seek”. Others include question, quest, query, inquire, inquisitive, acquisition, conquer, and require. If you think about it, can you see how the denotation of their common ancestor quaerere “to search, seek” binds them in meaning? Perhaps this would be a great opportunity for your students. Have small groups or individuals investigate the present meaning of one of the words I’ve listed and then come back together as a group to share. See if the students can notice the common sense and meaning at the core of each word. If the word <embonpoint> is skipped over in this quote, the reader will get a different impression of Tinker Bell than the author intended! I quite like the idea that Tinker Bell had a realistic body shape. That is not the way she has been portrayed in any movie version I’ve ever seen! 1876 R. Bartholow Pract. Treat. Materia Med. ii. 308 An increase in the body-weight and the embonpoint of those who take stimulants. James M. Barrie, however, wrote this story in 1906. I wonder if this word is currently used in France? Peter Pan tries several times but is unsuccessful in putting his shadow back on. That’s when Wendy offers to do it for him. MCT defines a housewife as a sewing kit. I’d heard this term before, but was sure my students hadn’t. I was right. Later on that same day, I found a picture of a housewife that was used by a soldier in World War I through Wikipedia Commons. I’m glad I did because it won’t be the last time Wendy uses her housewife. The Lost Boys will wear holes in the knees of their pants and in the heels of their socks quite often! It will also give us the opportunity to talk about why a soldier might need a housewife, and why this sewing kit would be called a housewife. In the 18th and 19th century, it was common for a mother, wife, sister, or girlfriend to make a housewife for someone who was going off to fight in a war. At that time, it was pronounced as “hussif” or “huzzif”. Read more about them HERE. I think “filled to the stretch” says it all! Peter Pan uses this word to describe what he would be required to learn in school. I can’t help but think that his biggest hurdle in attending school would be the confinement to a schedule! This word was first attested in the mid 14c. according to Etymonline. At that time it had a sense of “performed with due religious ceremony or reverence.” Prior to that it was from Old French solempne and directly from Latin sollemnis “established, formal, traditional.” It has this sense of seriousness, and that is no doubt the aspect of schooling that troubles Peter Pan the most! 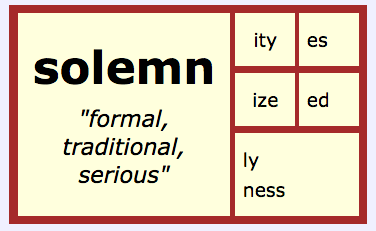 What is interesting about the spelling of <solemn> is the <mn>. We see this same final spelling in autumn, column, and hymn. Some may wonder why the <n> is needed since it isn’t pronounced. But if we remind ourselves that spelling doesn’t represent pronunciation, that instead it represents meaning, we are apt to look for another reason that the <n> is final in these words. If I take a look at relatives of each word, it doesn’t take long to see that the final <n> IS pronounced in some of the members of each word family. It isn’t pronounced in solemn, but it is pronounced in solemnity. It isn’t pronounced in autumn, but it is pronounced in autumnal. It isn’t pronounced in column, but it is pronounced in columnist. It isn’t pronounced in hymn, but it is pronounced in hymnal. If we look back at the etymology of <solemn>, we see that the <mn> has always been part of this word’s spelling. It is the same with <column> from Latin columna, <autumn> from Latin autumnus, and <hymn> from Greek hymnos. Interesting, right? This word was not unfamiliar to my students. What was unfamiliar was its use as a verb. At Etymonline, I find that this word was first attested as a verb in 1590 with a sense of “to smear or stain with blood.” By the 1620’s it was “to cause to bleed,” which I think is the sense being used by Tootles in this story. At the Oxford English Dictionary, I found several ways <blood> was used as a verb, but when it referred to “to cause blood to flow from … (a person or an animal)” it was for therapeutic reasons, not specifically to cause harm. 1597 P. Lowe Whole Course Chirurg. viii. i. sig. Dd Bee circumspect in blooding the foote. 1780 Johnson Let. 14 June (1992) III. 275 Yesterday I fasted and was blooded, and to day took physick and dined. 1908 Brit. Med. Jnl. 13 June 1463/1 He was very fond of telling tales of..how the country labourers would come in crowds..to be ‘blooded’. 2007 M. Noble Case of Dirty Verger viii.107 She burst the girl’s eyebrow, blooding it immediately and sending the victim backwards, dazed and distraught. A hanger is a short sword that hangs from a belt. It was a common weapon used by hunters. What I really love about this sentence though, is the image created with “for that instant his sun was at noon.” Can’t you just picture this scene? Tootles is defending Wendy’s honor and all the rest of the Lost Boys are looking on. Tootles is having his moment. Just as with the sun at noon, there are no shadows cast on Tootles. His character is illuminated. I know this word as a noun. We have a rain gutter on our house, and there is a gutter at the side of our street that directs water to the storm drain. But I am not as familiar with it as a verb, especially when it is not pertaining to a channel for water. James M. Barrie creates another wonderful image with an intriguing use of this word. As a verb, this word is first attested in the late 14th c. and was used to mean “to make or run in channels.” We see the same information in the OED where gutter most often refers to water being channeled and moved. 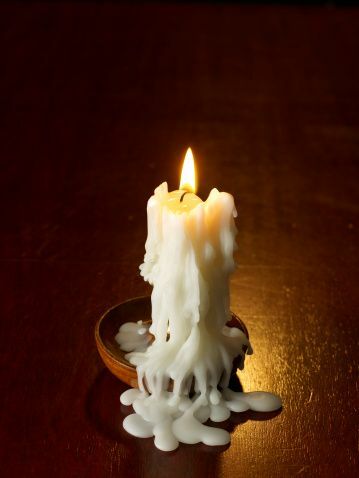 But according to both Etymonline and the OED, it can also refer to a candle when the hot wax flows down its side by way of a gutter that has opened up. That use began in 1706. I’ve certainly lit my share of candles and have seen that happen many times, but never thought to describe it as guttering. Cool. Precipice – When you are at the precipice of a place or situation, you are at a steep edge with the possibility of falling. Precipitate – This word can be used in many ways. It can be used as a verb meaning that water vapor is condensing and falling from the sky. Another meaning it has as a verb is to cause something to happen quite abruptly. It can also be used as a noun to describe a substance separated from a solution or a suspension (in science). There are other (less frequent) ways to use this word as well! Precipitation – This form of the word is a noun, but you probably saw the <-ion> suffix and knew that. It refers to the various forms water vapor can take as it falls to the earth. It can also refer to the process of forming a precipitate (as described above). Long Tom is a cannon on the deck of the pirate ship. At this point in the story, Starkey is told by Captain Hook that he must go into the cabin. Starkey doesn’t want to go because three others have gone into the cabin already and they have all been killed. Nobody knows what is in the cabin that is killing the men, and Starkey decides to die by precipitating himself into the sea rather than face whatever is in that cabin. Using context and combining that with the sense of falling that this word can have, it makes sense that by “he precipitated himself into the sea,” it means that he threw himself overboard. At Etymonline we learn that this word was first attested in the 1520’s and meant “to hurl or fling downwards.” It is from Latin praecipitatus “throw or dive headlong,” from prae- “before, forth” and caput “head.” The chemical sense of this word is from the 1620’s, and it isn’t until 1863 that we see it used in the meteorological sense. Interesting, right? So in every use of this word or one of its related words, there is a sense of falling head first or the possibility of falling head first. If you have not read this book with a child, I encourage you to do it. The character of Peter Pan is rather complicated. By that I mean that he isn’t consistently one way or another. Sure he delights the other characters and he saves them from harm, but he also disappoints them and sometimes he even lets them down. His personality is not as simple to understand as it is in movie versions. He seems a bit more human as described in the book, and that makes a big difference. It has led to wonderful discussions about what to expect from him next. The Lost Boys and the Darling children were at the mercy of his whims often. For instance, there were times that everyone ate food and other times in which everyone pretended to eat food. Peter decided which it would be based on his own preference. He wasn’t trying to be mean, he just didn’t consider anyone’s needs for that sort of thing besides his own. I will never forget what it felt like to share this story with those students as I read that line! They immediately recognized the words that had once been said by Wendy, but were now being said by her daughter. Their eyes jumped from the page to the other faces in the room. There were gasps and nervous laughter as they realized that what those words meant this time was so much bigger than what those few words meant the first time they were uttered. It meant there was a never ending ending to this story. And we all smiled big to know it.